Born July 2, 1930 near Romance, SK to parents Joseph and Margaret Pitka. David grew up on the farm with his brothers Richard, Maurice, Patrick, and sister Louise. David began his long career with the Watkins company, which eventually led up to him being district manager for western Canada. He married Violet Verlage on July 11, 1964 and moved to Saskatoon. His love for horses continued as they bought an acreage where they spent time raising Arabian horses, various kinds of ducks, geese and poultry as well as gardening. David was a very loving husband to his wife Violet, a great father to his two sons Dwayne and Daryl, daughter-in-law Renee, and a wonderful grandfather to his granddaughters Jenna and Laura. 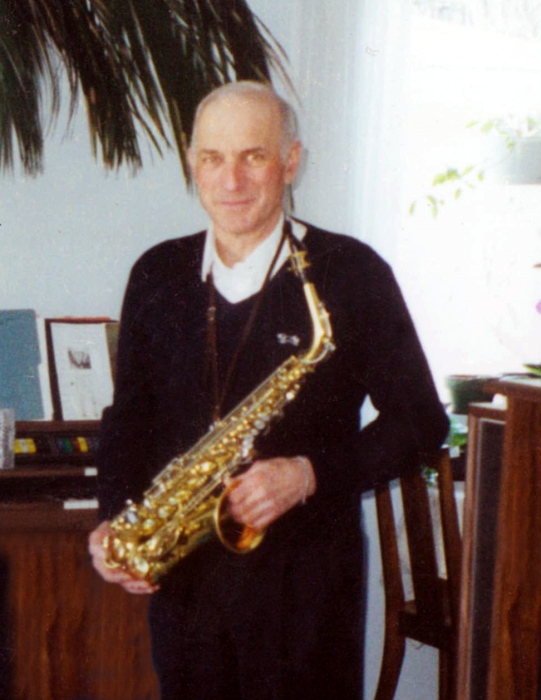 David loved music and played many instruments, his favorite being the Saxophone. He played in many bands over the years, as well as playing with Violet for the church service in the chapel, and visiting with the inmates with the prison ministry (for 21 years). He was a lifetime member of the Knights of Columbus and a member of Holy Family Cathedral, where he was also on the Parish Council, and usher for many years. David spent his last years at Sherbrooke Community Centre where Violet visited him daily. He will be remembered by his family, including brothers, sister, in-laws, many nieces, nephews, and countless lives he has touched over his lifetime. David is survived by his wife Violet; two sons Dwayne (Renee) Pitka of Saskatoon (and their two children Jenna and Laura) and Daryl Pitka of Saskatoon; brothers Richard Pitka, of Leroy, Patrick (Karen) Pitka of Saskatoon, and one sister Louise Brecht of Asquith, SK; as well as many cousins, nieces and nephews. He was predeceased by his parents Joseph and Margaret Pitka; and brother Maurice Pitka. Donations in David’s name may be made to The Cathedral of the Holy Family (Saskatoon). A Mass of Christian Burial was held at Sherbrooke Community Centre.